Jerry Rice card collectors are a devoted bunch. 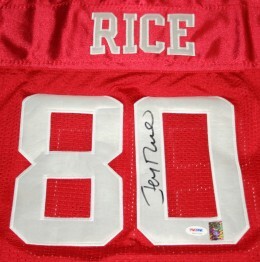 Rice is widely considered the greatest wide receiver of all-time. During his storied career, Rice set NFL records for most career touchdowns (208), receptions (1,549) and receiving yards (22,895). The Hall of Famer teamed with Joe Montana and Steve Young to win three Super Bowls and was named the Super Bowl XXIII MVP. Rice played for four teams during his 20-year career but will always be remembered for his time with the San Francisco 49ers. Known for his work ethic and love of the game, Rice makes a great addition to any football or sports collection. Inducted into the Pro Football Hall Of Fame in 2010, Rice has likely achieved the last big honor of his career and there is nothing on the horizon that will push values higher. Collectors expecting big returns are out of luck, but Jerry Rice card and memorabilia values will hold in the short term and should slowly push higher over time. 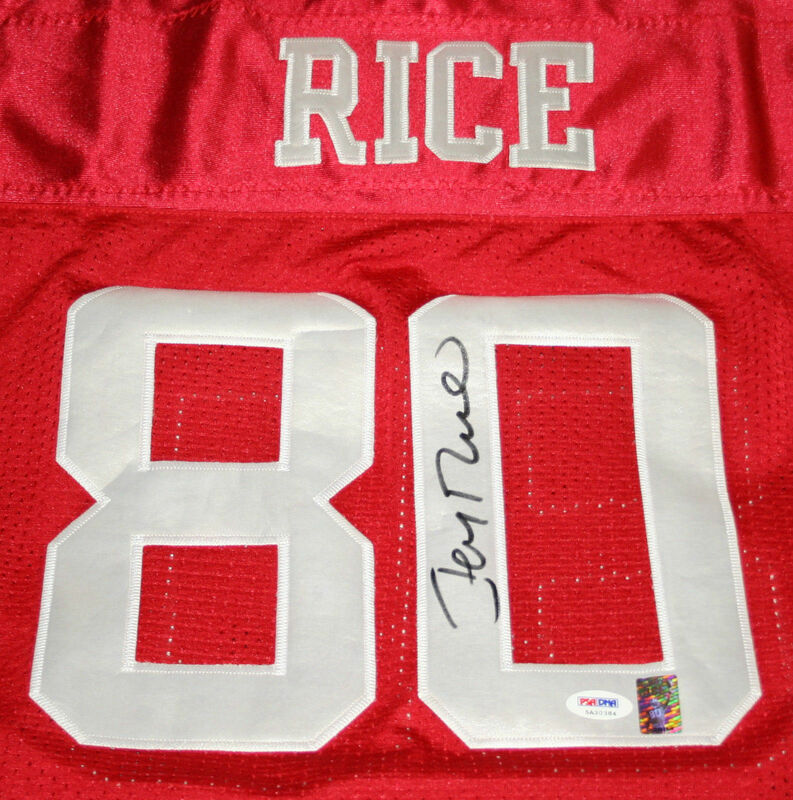 Despite his many contributions to the game, Rice's autograph prices are very reasonable. 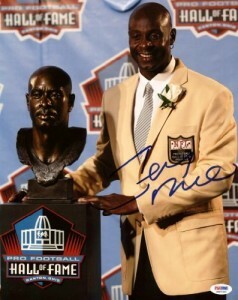 There is just one rookie Jerry Rice card. His 1986 Topps Football card is the main draw for collectors in a rookie class that also includes Reggie White, Andre Reed and his 49ers teammate, Steve Young. 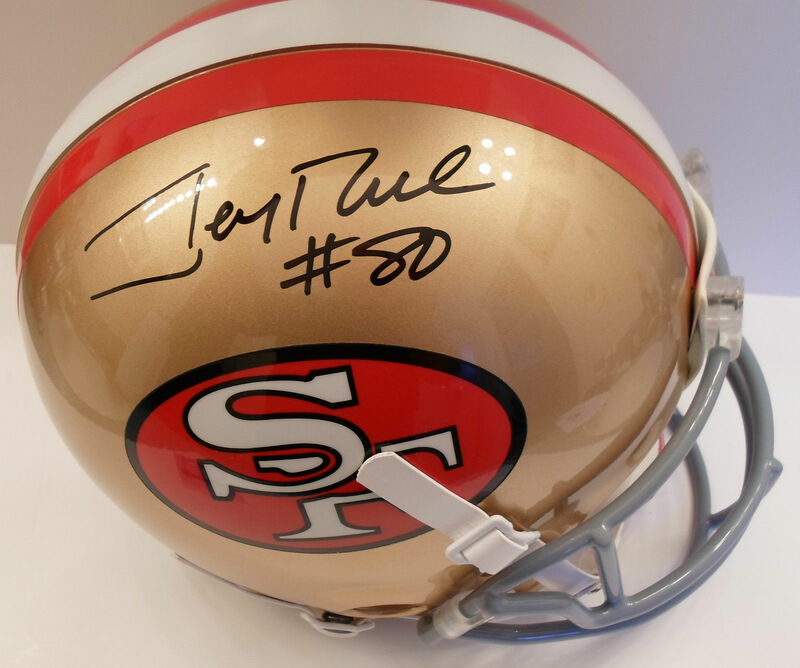 Jerry Rice is an avid autograph signer, regularly appearing at public signings. His championship success and exuberant personality when interacting with fans has endeared him to multiple generations of fans. The design on the lone Jerry Rice rookie card is anything but boring. Diagonal striping over a green background evokes an awkward image of a football field. Combined with a thin yellow border, red name box and light blue team box, the card is a bizarre combination of colors. 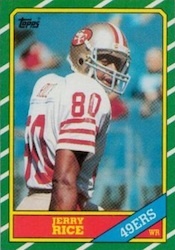 All things considered, it's a rather unfortunate-looking Jerry Rice card. Many of the card suffer from centering issues, but even mint versions can be found for a few hundred dollars. 2003 ULTIMATE JERRY RICE TERRELL OWENS #D 10 DUAL PRIME PATCHES LOGO HOF ? 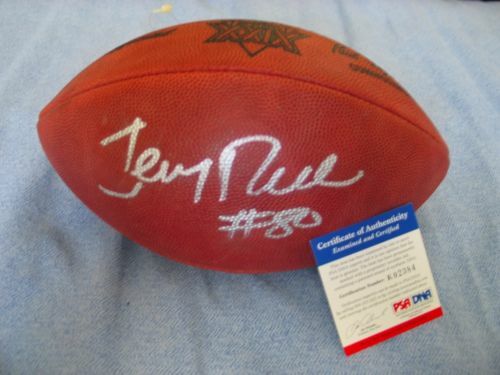 Below you will find an example of what Jerry Rice's authentic signature looks like. This can be used as a first point of reference for determining the legitimacy of autograph memorabilia, but is not a substitute for having your items authenticated by a well-respected professional autograph authentication company. Some of the trusted sources within the sports memorabilia market include the following companies: PSA, JSA, Tristar, and Mounted Memories. Click on any of the images below to view full size photos. The entire signature is written on a horizontal plane of about 25 degrees. The signature, overall, is very legible. The letter "J" is distinct in that it is printed and not written like the rest of the letters. It also, almost always exhibits a break in the vertical line right before the curve. The letters 'e-r-y" are visible, with their being just one "r", which is very small. The pen lifts to start the last name with a pronounced "R" that does not contain a closed loop. The letters "i-c-e" are visible with the "e" being most pronounced. The letter "i" is not dotted. 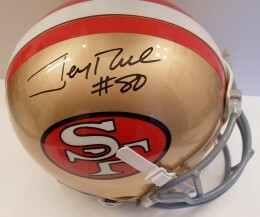 The inscription "#80," is often, but not always, accompanies his signature.